A beautifully illustrated book for children ages 6 and up relating the classic northwest coast myth telling how Raven, the trickster, freed the moon from the old fisherwoman&apos;&apos;s cedar chest and carried it to its rightful place in the heavens. Entrancingly retold from the female viewpoint by the celebrated author of Dreamspeaker and Daughters of Copper Woman. 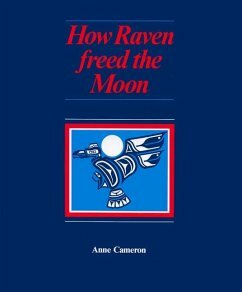 Anne Cameron, Books, How Raven Freed The Moon Books, Harbour Publishing Co. Ltd.
[EAN: 9780920080672], Gebraucht, sehr guter Zustand, The book has been read, but is in excellent condition. Pages are intact and not marred by notes or highlighting. The spine remains undamaged. A beautifully illustrated book for children ages 6 and up relating the classic northwest coast myth telling how Raven, the trickster, freed the moon from the old fisherwoman's cedar chest and carried it to its rightful place in the heavens. Entrancingly retold from the female viewpoint by the celebrated author of &lt;I&gt;Dreamspeaker&lt;/I&gt; and &lt;I&gt;Daughters of Copper Woman&lt;/I&gt;.